This is part two in a four-part series highlighting different winter forecasting techniques. Could a black box in New Hampshire contain the secret to predicting winter weather? Adherents to the Old Farmer's Almanac, which has been published every year since 1792, might tell you that it does. But what exactly is inside this box, and how accurate are the forecasts found in a farmers' almanac? The story of almanacs in America dates back to 1732, when Benjamin Franklin, a scientist and later a diplomat and politician, first published Poor Richard's Almanac. It included weather predictions based on his astute observation that weather systems moved from west to east, with seemingly predictable changes in wind patterns between systems. His predictions weren't always accurate, but Franklin had a witty response to his critics: "No one... will allow that we always hit the day of the month," he said. "We only ask an allowance of a few days and if there still be a mistake, set it down to the printer." Poor Richard's Almanac was last published in 1758, but 34 years later, Robert B. Thomas picked up where Franklin left off, publishing the first Old Farmer's Almanac. Unlike Franklin, Thomas didn't rely heavily on observed wind patterns and weather systems to make his predictions. Instead, he used sunspots and other astronomical cycles to create a formula for forecasting the weather. 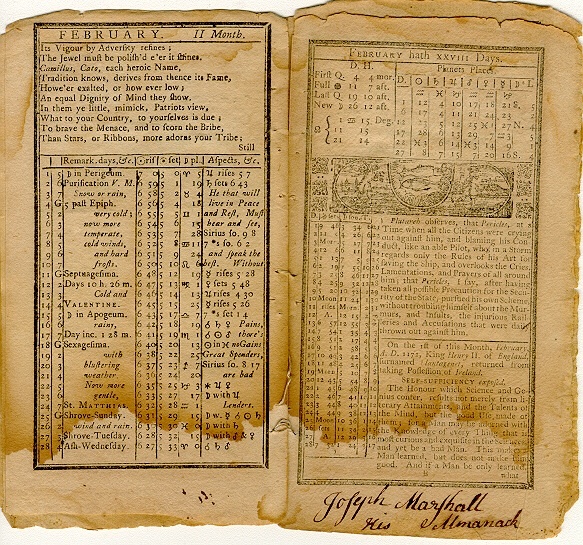 According to the Old Farmer's Almanac, Thomas's secret formula has been tweaked over the years, but its forecasts are still based on solar activity and how current climate and sunspot conditions compare with those in the past. And as always, the formula is locked in a black box in Dublin, NH, unseen by all but a few forecasters. Another long-lived publication famous for its weather predictions is the similarly named Farmers' Almanac, which was first published in 1818 by editor David Young. Like Thomas, Young based his forecasts on astronomical observations, including sunspot cycles and the positions of the moon and planets. Today's predictions also include historical weather conditions, but little is otherwise known about the forecast recipe, which Young called his "weather canon". Although the formulas used by the Old Farmer's Almanac and the Farmers' Almanac may be cloaked in secrecy, their predictions are available for anyone to view. We reviewed these forecasts for recent winters to see how they compared with the observed weather conditions. 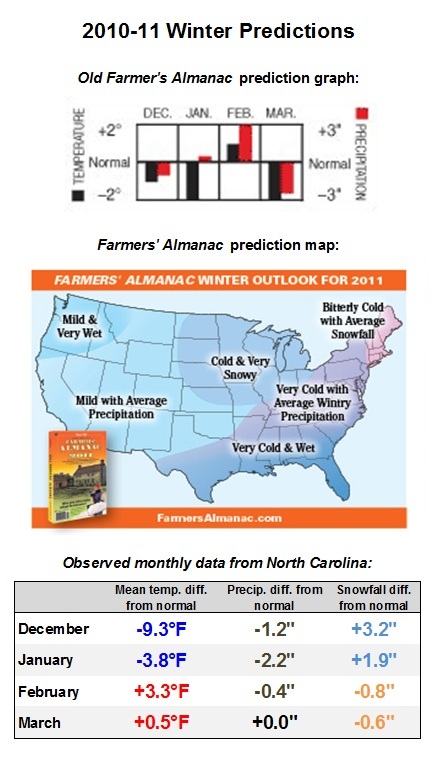 For the 2009-10 winter, they both correctly predicted near-normal precipitation for most of the winter, but neither forecasted the cooler weather in December and February. 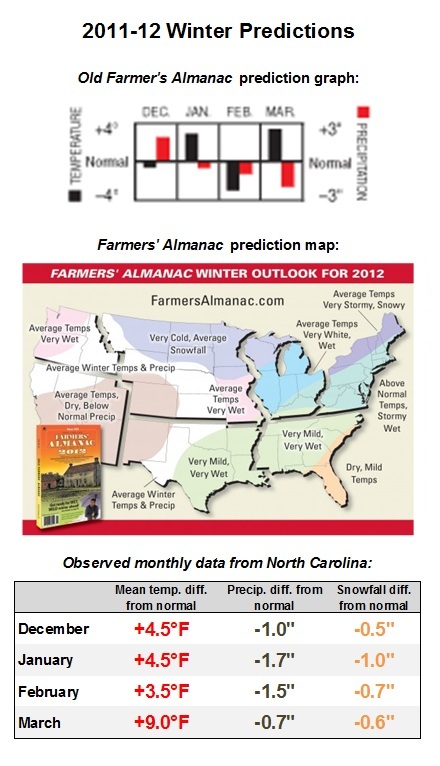 During the 2010-11 winter, the Old Farmer's Almanac did well with the overall temperature trend but underestimated the early-season cold weather, while the Farmers' Almanac's forecast of "Very Cold with Average Wintry Precipitation" was accurate for the early winter, but not so much for February and March. 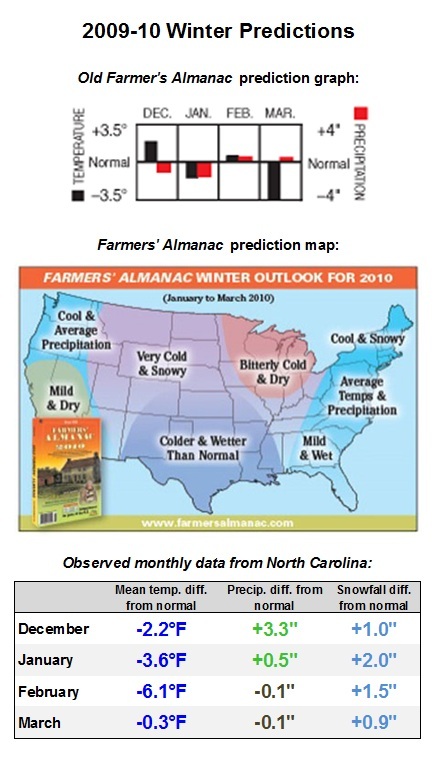 In the 2011-12 winter, which was warm and dry across the board, the Old Farmer's Almanac's predictions for a wet December and a cool February didn't pan out, while the Farmers' Almanac was correct about very mild conditions but missed on its prediction for very wet weather. So is there any science behind the predictions in these almanacs, and are they really 85% accurate, as some readers believe? The secret formulas may be well-guarded, but they are certainly no guarantee of forecasting success. Truthfully, there is limited skill in long-term weather forecasting, especially when relying on indirectly related astronomical parameters. With that in mind, it can be interesting to read the weekly almanac forecasts that are updated every month. In November 2010, the Old Farmer's Almanac forecasted sunny and warm conditions for December 21 through 25. Of course, we now remember that in 2010, North Carolina saw its first White Christmas in many years. Perhaps that almanac should adopt Benjamin Franklin's line of thinking: It was the printer's fault!